Staff Correspondent: Home Minister Asaduzzaman Khan Kamal said BNP Chairperson Khaleda Zia who is now in jail after being convicted in a corruption case will be taken to Bangabandhu Sheikh Mujib Medical University (BSMMU) for medical tests as per the recommendation of the medical board. The home minister said this after holding a meeting with a six-member BNP delegation at the Secretariat on Tuesday. Asaduzzaman said a medical board, formed at the court’s order, examined Khaleda on February 24. “She needs to undergo some tests. They will be done at BSMMU,” he said. The former prime minister has been receiving “the best treatment” as per jail code, he said. The meeting began at the home ministry office after the delegation had reached the Secretariat at 2:30 pm. 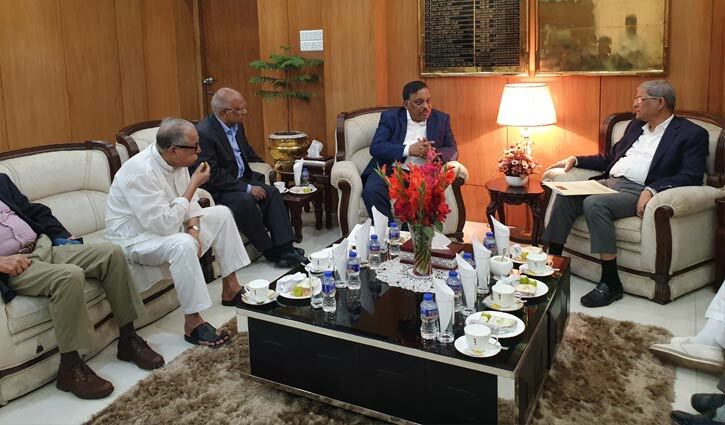 The delegation led by BNP Secretary General Mirza Fakhrul Islalm Alamgir included party’s standing committee members Dr Khandaker Mosharraf Hossain, Mirza Abbas, Nazrul Islam Khan, Dr Abdul Moyeen Khan and Amir Khasru Mahmud Chowdhury. Khaleda has been in jail since her conviction in a corruption case on February 8 last year. She was later found guilty in another corruption case.